Myles and Heather Geyman's modern cookbook stand puts your tablet out of harm's way. Heather and Myles Geyman's modern cookbook stand puts your go-to gastronomical guide out of harm's way while keeping your low-fi kitchen tools at an arm's reach. With a convenient notch specially designed to fit your tablet, the holder keeps the screen in view and your counter clutter-free. The artist slip cast the dock/holder from white stoneware that is finished with a subtle speckled glaze. Handmade in Pittsburgh, Pennsylvania. 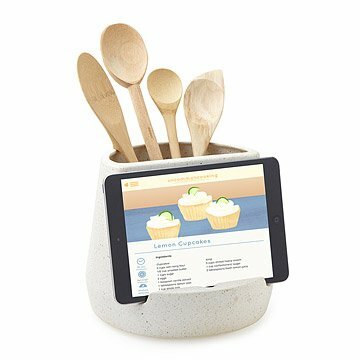 Love this crock/iPad holder. So functional but looks great too. What a great idea! Item was a gift. Arrived damaged so packaging for shipment was a problem. However, return was easy and when it finally arrived a month after Christmas they loved it and thought it great. This product is fantastic! Everyone admires when they comes into the kitchen. Looks great on counter. Secured iPad so you can use while cooking. She will use it as designed. This product was a win for mom! I bought this for my mom for her birthday and she loves It and uses it every time she cooks! This is a brilliant idea! I'd like to get one for myself too! My Aunt seemed to love it and my grandma wanted one too! As a kitchen utensil and tablet holder, the design is something the you will want to display, but the function is gold. Trying to find somewhere to wedge a laptop and not interfere with the meal prep process or trying to use a tablet that wasn't always falling over or onto the floor, was extremely trying. Having to keep walking across the kitchen while following a recipe, annoying at best and not a solution. On first use of this product, happy to say those days are gone! The well is large enough to fit necessary cooking utensils, or flowers if you like, along with a shelf that securely holds a tablet in place, yet remains compact enough not to interfere with meal prep at all. And having the convenience of your recipe at the right height and the right place, I cannot recommend this piece highly enough. Very well done! Clever product, many uses in kitchen, office, patio etc.